Stella Luna Visits The Petting Zoo! Home » Stella Luna Visits The Petting Zoo! 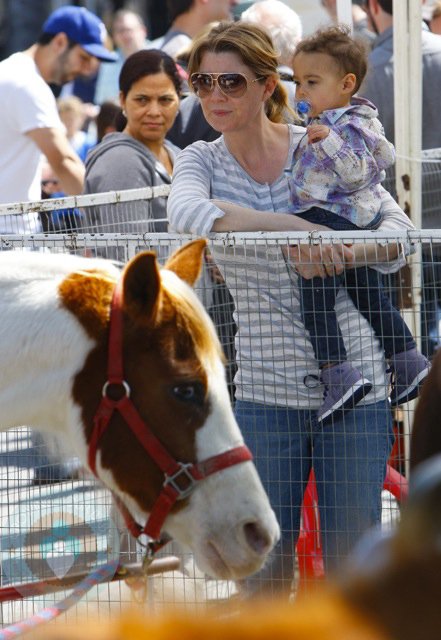 Ellen Pompeo was spotted yesterday enjoying some time with her daughter Stella Luna at the petting zoo! While out at the market, the pair visited with the goats, horses and even got up close with a baby chick. Stella looked adorable in a sweet purple dress shirt, skinny jeans and matching Nike high tops. Heidi Klum Shops with Lou! Tori and Dean Expecting Baby #3!